Towards the end of the 13th century, the estates in which Beaufort Castle was built passed from the Bissetts to the Frasers of Lovat - who were to reside there until the 1990s (apart from the spell when it was forfeited for supporting the Jacobite Uprising). Despite its northerly position, Beaufort Castle (known at that time as Dounie Castle) was besieged by the English in 1303 when King Edward I tried to hold sway over the country. It was not until the following year that Edward captured the last Scottish castle (at Stirling). But even after the War of Independence was won, the Frasers were intermittently fighting the MacDonalds of Clanranald. In 1544, it came to a head in the "Battle of the Shirts" between members of the Clan Fraser and Clans Ranald, Cameron and Donald. One of the bloodiest clan battles - only 12 men out of 1,000 combatants are said to have survived. The Frasers were defeated and Lord Lovat and his son were both killed. Fought on a warm day in July, the clansmen fought in their shirts - hence the name of the battle. Simon Fraser, 11th Lord Lovat, did not support the Jacobite Uprising in 1715 but in 1745 he supported Bonnie Prince Charlie (while at the same time trying to convince the government that he preferred the status quo. At Culloden, Frasers of Lovat made up the largest Centre Regiment of the Front line, with 400 men under Simon's son, Charles Fraser of Inverallachie. Simon Fraser himself was too frail to take part in the battle himself and, after two years on the run, was captured and executed in London. The Fraser estates were forfeited and the castle (still know as Dounie at this time) was destroyed. 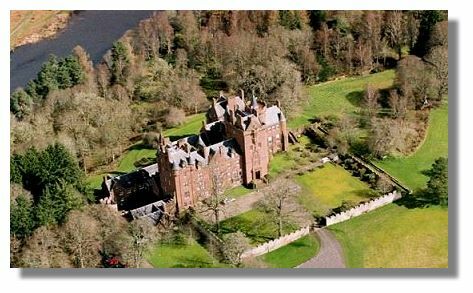 Eventually the Fraser family recovered their lands and titles and a new family home was built on the site of Dounie Castle - and was named Beaufort Castle. The Lovat Scouts (see crest) was formed in January 1900 for service in the Second Boer War by Simon Joseph Fraser, 16th Lord Lovat, father of the World War II commando, Simon Fraser, 17th Lord Lovat. In the 1990s, the Beaufort Castle and its estate were sold because of debt. The owner since 1995 is millionairess Ann Gloag, a Scottish business woman, and sister of Brian Souter. Together they founded and built up the Stagecoach transport group. 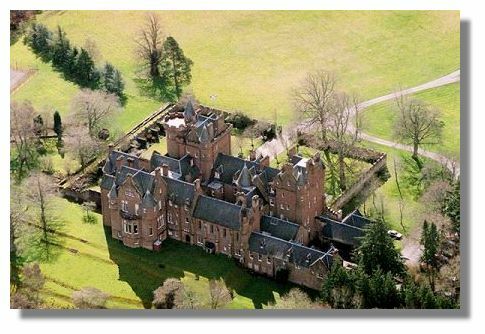 Note: The photos of Beaufort Castle on this page are copyright Scotavia Images who provide a quality aerial photography service for Scotland. Prints from their large online gallery are available for purchase. If you have ancestors with a Scottish Highland origin, they can provide an aerial view of the area they came from!